Have you ever thought about a day trip from Venice to the Dolomites? Most people don’t know that in about 2 hours you can reach one of the most beautiful UNESCO spots in Veneto and live a day surrounded by its magnificent mountains. 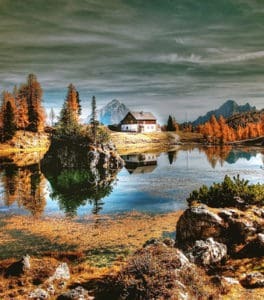 If you like hiking or simply you would like to spend a day seeing one of the most enchanting natural places in our region and breath some fresh air, you definitely must consider the idea of a day trip from Venice to the Dolomites, especially if you’re planning to stay in Venice more than just a weekend. You have many ways to get to the Dolomites and we are going to talk about all of them in this article. As we said, you can decide to reach the Dolomites in different ways: by car, by train or by bus. Let’s see all the possibilities and evaluate what option suits you best. If you don’t feel comfortable driving in Italy, there’s no need to rent a car to get to the Dolomites, but you should be aware that getting there by train is not so immediate. Venice train station is less than 10 minutes away from our hotel and there you can catch a couple of trains to Calalzo di Cadore, a town located at the feet of the massive Monte Antelao, and then take a bus, with Dolomiti bus company, to Cortina d’Ampezzo. Cortina is famous for being VIP’s favorite location for holidays, but it’s not the only reason why visiting it is worth it. It’s really a gem, especially during the winter season. Getting here from Calalzo it takes about 50 minutes. Instead, the journey from Venice to Calalzo by train will take about 4 hours. Taking a bus from Venice to Cortina is probably the fastest and the most convenient way to have a day trip to the Dolomites. The Atvo bus company has a line going directly from Venice to Cortina, passing through Treviso, but there’s also another private company that you can take, called Flixbus, which takes you there even in only about 2 hours. Obviously, this is the easiest way to have a nice and stress-free day trip to the Dolomites from Venice. If you decide to rent a car, you can think about going to the Tre Cime di Lavaredo and walk around these three huge and spectacular peaks. This journey will take you about 2 hours and a half, quite a good deal if you really want to see this place that is visited by people from all over the world, every year. So, making a day trip from Venice to the Dolomites without having to book another hotel and be able to come back to Venice for the night is something you can actually do. If you’re interested in having a journey like this, don’t hesitate to ask us for more information and suggestions at the reception desk.